What are "columns in antis?" In Antis Columns are 'in antis" when they stand between square piers call anta. With this post I'm joining Fifi Flowers' Fashionable Friday because this idea has been fashionable for several thousand years! "Columns in antis" is an old design idea, really old. This is a Leila Ross Wilburn foursquare arts and crafts house in Decatur, Georgia built about 1915. It's an absolutely distinctive look that's literally 1000's of years old. The square brick columns are anta, basically posts on either side of a doorway. The smaller columns between the anta are said to be "columns in antis." It's a mostly a decorative effect these days. It's a look rather than a structural requirement. With modern materials, like steel beams, we don't need the interior columns. But in the old days, say 500 B.C., when the walls were soft brick or adobe, you needed strong posts (anta) at the corners and at the ends of a wall to hold lentils over a doorway. It makes sense to our eyes: strong posts at the edges and something holding up the middle. Without the columns our brains sense something wrong. Classical ideas are about our brain chemistry and genes as well as aesthetics, function and physics. Now that we know the term, let's keep our eyes peeled for columns in antis. This classical design idea has been in fashion for more than 2500 years. It's got at least 2500 years to go. Here is another Leila Ross Wilburn home. Very nice and very different. It's an effect you are more likely to see indoors. So check the magazines too. This one is very interesting. The columns sit on tall, chunky plinths. It's a very grand craftsman facade. A 1927 office building, the threatened Crumb and Forster Building on Spring Street by Lewis Edmund "Buck" Crook. This one is really old, the Temple of Apollo Epicurius at Bassai, constructed between 450 BCE and 400 BCE. It's among the most beautiful buildings in the world. The columns in antis are outlined in pink. The columns are long gone but the columns in antis were certainly there. Image courtesy User:Bibi Saint-Pol at Wikipedia. Columns aren't just for temples. You can use classical ideas and proportions in Art Deco Buildings. Here are colossal (spanning more than one story), fluted "pilasters in antis" in the 1929 Troy Peerless Building. It's looking good. Poinsettias still hanging in there? The sun caught these just right - in March. One March day about lunch time these guys were hanging out in the parking lot of Manuels's Tavern. This the the horses' view north to Maneuls. Julia over at Hooked on Houses is hosting her "Hooked on Friday's" blog party. I'm hooked on landscape plans and our curved driveway. There is a concrete bunny story at the bottom, if you can make it that far. We were on the home stretch in the Fall of 1989. The reno was nearly done, we were ready to move back from 7+ months in a 2 bedroom apartment with our 1, 4, and 6 year old. 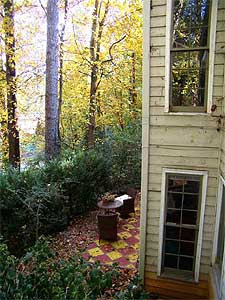 This is a 1/5 acre lot at the end of a rare in-town Atlanta cul-de-sac. Our block was originally built out in 1950 with "Minimal Traditional" 3br, 1 1/2ba, 1,200 sq.ft homes. To the west about 12', a house. To the east, there is a big drop off as you can see from the picture with the checkered patio. This didn't go exactly like Curb Appeal, or Landscape Smart. The yard was a muddy / dusty mess. Of course we had run out of money. We had to start a yard to get the final loan. We were exhausted in every way. We said, just do it! The basic plan was "low" bushes in the front and never let them overgrow. You'll need to click on the "see the huge..." links to make the plans readable. The plans and plant lists are a little further down this post. Trust me, they really are. How did it all turn out? Even considering the architecture tourist's black- thumb-of-death, some of the landscaping is still going strong. Something blooms 9 months of the year and there is color going even in the winter. The fundamental shape of everything is still works. The 2 cherry trees, the rhododendrons, the azalias and the Japanese maples rock the house. I think the back yard turned out better than the front. The azaleas look pretty good from the kitchen, huh? The curve keeps the driveway from being the dominant visual feature of our front yard. It's hard to hide concrete on a small lot. It gives us room for a planting area west of the driveway that frames and separates our house from the one next door. It makes both houses look better. The plantings help hide our cars from the street. This is a neighborhood of 60 year old unusable garages. Folks park in their front yard driveway and on the street. It makes our house unique, there aren't any other curved drives for houses like ours in the neighborhood. The curve gives our tiny house and yard an upscale feel. The curve gives us little more driveway. It's a little longer and wider now. We can put a few more cars in it. It would hold the Merdeces, the Beemer, the RV, and the boat - if we had any of those. It hides the view to the garage a little. I guess it's a Zen view of the garage. It makes you wonder what's around back of the house. It visually compliments our curved "bunny" retaining wall on the other side of the yard and the informal curves of the planting area. It helps soften the facade which is mostly angles - bump outs and gables. You can see how much space we created with the curve. Our neighbor added some stuff on their own and made it look twice a good. Click here to see the huge, readable front yard plan. Click here to see the huge, readable backyard plan. Some years our rhododendrons just out do themselves. The Japanese Maple started small but never fails us in spring and fall. Our bunny stands guard at the end of the curved wall. About the bunny and curved wall. At the time I didn't understand. 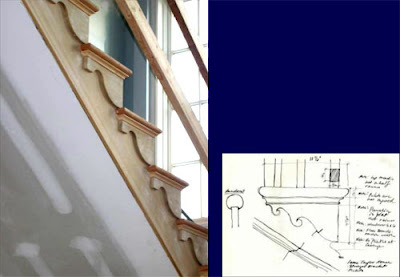 Bill designed the curving wall and the pillar from the very beginning. Bill said, "When you walk up to the door, the wall will be putting it's arm around your shoulder." On one shopping trip Gordon spotted the concrete bunny and wouldn't let it go. Gordon said, "We're going to need it," for what, he didn't tell us. When the house was nearly finished, Bill made the wall longer to suit his eye. The Masons built the column with a flat top. Gordon was there and said no way. We scouted the yard for more brick and Gordon directed the built-up top. Then Gorden said, "Where's the rabbit?" We produced it and the mason put it on top. The front yard took a beating when we repaired the sewer pipe and improved the drainage. Whew. I know that if you've made it this far, you are probably worn out. So here is a link back to: Hooked on Houses. The landscape even looks good in black and white. Is taller always better? No, and it's even more complicated than that. A Pattern Language: Towns, Buildings, Construction by Christopher Alexander, Sara Ishikawa, Murray Silverstein. "A building in which the ceiling heights are all the same is virtually incapable of making people comfortable. "Vary the ceiling heights continuously throughout the building, especially between rooms which open into each other, so that the relative intimacy of different spaces can be felt." The Central Congregational United Church of Christ on Clairmont Road in Atlanta is a modern building, invisible from the street. Few have ever seen it, even fewer have seen the inside. This is a special place. For stubborn traditionalists: When architecture is done this well - in any style - it can change your mind. Here's the sanctuary as you drive up a winding, hilly road. This is the entrance to the offices, the main activity room, and the lobby. 8 foot ceilings, huge windows, interior and exterior - this place feels good. The volumes make this space feel wide open, the offices to the left are cozy without losing the light or view. The lobby / reception room really got me thinking. It connects every part of the church - the crossroads. It's a large room, fit for a small to medium wedding reception. It feels perfect, comfortable and human. It has an 8 foot ceiling! Impossible. Aren't big public rooms supposed to have high ceilings? 2250 Square Feet with an 8' ceiling. Wallflowers might find the courage to talk to strangers in this room. The 8 foot ceiling continues from the lobby into the sanctuary. A sanctuary with a fireplace lounge? The lounge is a cozy, antechamber. It is a convex space that looks out to the sanctuary, to the garden, and to the lobby. 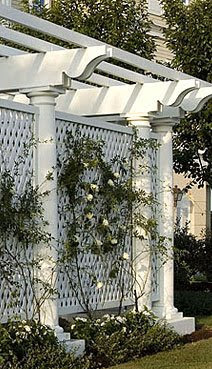 Thanks to Pam Kersting at GardenDesigns+more for explaining "convex" spaces to me. The low ceilinged lounge is like a safe observation deck. You are in the sanctuary but protected. Here is the view from the lounge. What a feeling. The low ceilinged lounge, is a very comfortable place to gather the confidence to go further. The ceiling rises higher, the floor falls away. "...then the mere fact that the ceiling heights vary, allows people to move from high rooms to low rooms, and vice versa, according to the degree of intimacy they seek - because they know that everyone correlates intimacy with ceiling height..."
I don't think it's very cozy down here if you are the preacher or the choir. The idea of a lower ceiling within a breathtaking sanctuary is hardly modern. Chatres Cathedral's aisles, are separated from the nave by a rows of columns and are made more intimate with a lower ceiling. You can feel cozy alongside the nave. Our modern church gets the very same effect using a different method. Central Congregational United Church of Christ is a must see for Architecture Tourists. First Congregational Church of Atlanta has a shared heritage with Central. It's a quite different but wonderful place. It is undergoing renovation right now. I've had the great pleasure of attending a jazz performance there presented by senior minister and musician, Dwight Andrews. It was a great night in a wonderful, historic building. Julia over at Hooked on Houses is hosting her "Hooked on Friday's" blog party. I'm hooked on Chadsworth Cottage and Chadsworth Columns. I just hope to introduce you to the Chadsworth Columns website and to entice you with some pictures of the Chadsworth Cottage. Here is what I hope you'll enjoy from the post. Who knows, you might need some columns some day. Chadsworth Columns: Chadsworth's 1.800.COLUMNS has a remarkable website that any design lover will enjoy. 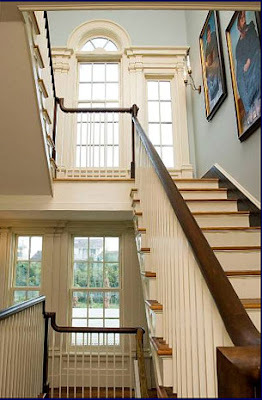 It's almost exhausting - hundreds of pictures of columns in remarkable homes - interiors, exteriors, and landscapes. Chadsworth columns are everywhere. Chadsworth Cottage is a classical vision, a labor of love by owner, designer, and craftsmen. This may not be you personal favorite beach house but there is plenty here to please the eye. The design and craftsmanship are top level. Owning a column company is one of my ideas of the perfect job. My study outline is below the next picture. I think you'll enjoy exploring Chadsworth. The tenuous location is part of the charm. I'd expect it to generate some strong opinions. 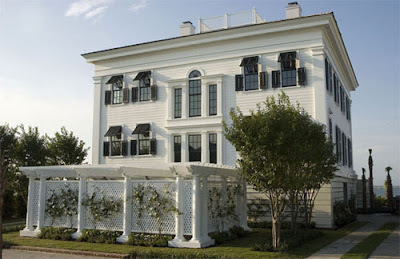 Chadsworth Cottage is a 2007 Palladio Award winner for New Construction – less than 5,000 sq.ft. Chadsworth Cottage slideshows: under construction, drawings and finished. 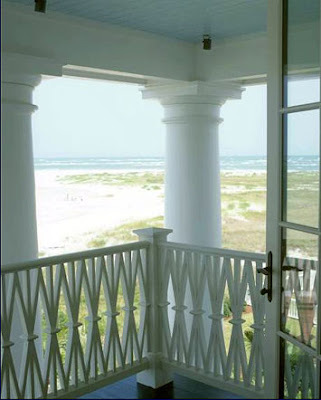 Chadsworth Columns has acres of breathtaking picutures of columns used in magnificent interiors, exteriors, landscapes. Not all are mansions. Column "parts" and orders defined and illustrated. 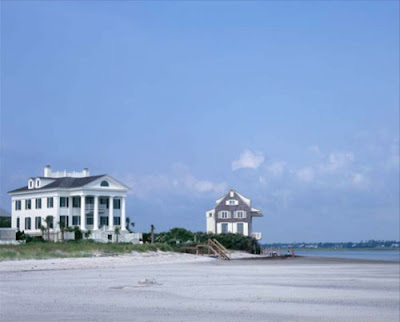 Compare the classical estate-type beach house at Figure 8, to the classical-vernacular, in a "new urbanism" setting at Seaside. From Quinlan Terry: "How can you find men to do your class of work these days?' as if men no longer can or want to produce skilled work. The truth is that whenever there is good work to be done there are men to do it...Generally, I find that the more intricate the detail, the more willing the tradesmen are to take on the work." The Chadsworth Cottage slide shows don't work so well in Firefox. Better use Internet Explorer. Off the sand and onto the cool brick floor. The Chadsworth Cottage slide show has floor plans, preliminary drawings, and construction pictures to show how things came together. Thanks so much to Rosemary at 1.800.COLUMNS for allowing to use these pictures. 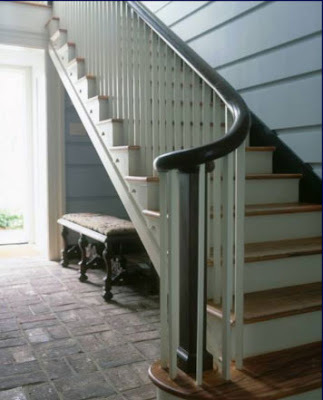 Christine Franck, designer of Chadsworth Cottage was kind enough to send these images. Christine answered some of commenter questions below. First, this is really where we'd like to be right now. "...and a watercolor sketch I [Christine}] did one weekend, shows the view from the inlet..."
The Greek temple on Atlanta's Ellis Street is a parking deck!! From the corner of Forsyth and Peachtree street architecture tourists see this vision of a gleaming white Greek temple with colossal , closely spaced columns. It's the parking lot for the 191 Peachtree Building. It's on Ellis Street Right behind the Ritz Carlton. This is from the Downtown library looking northeast. Here we are on Ellis Street. Still looks like a temple, doesn't it? This is the Peachtree Center Avenue facade. It's the best parking deck in Atlanta. It is better than the 191 Building? That's the tall building that belongs to the parking lot. While you are on Ellis go one more block east to look at this beauty at 54 Ellis Street. I don't know the name of this building. At some point it was the Southern Territorial Headquarters building for the Salvation Army and later the Atlanta Union Mission. Why waste a great garage on a stupid car?